The red/blue (Clinton - Trump) division of Whatcom County GE 2016. 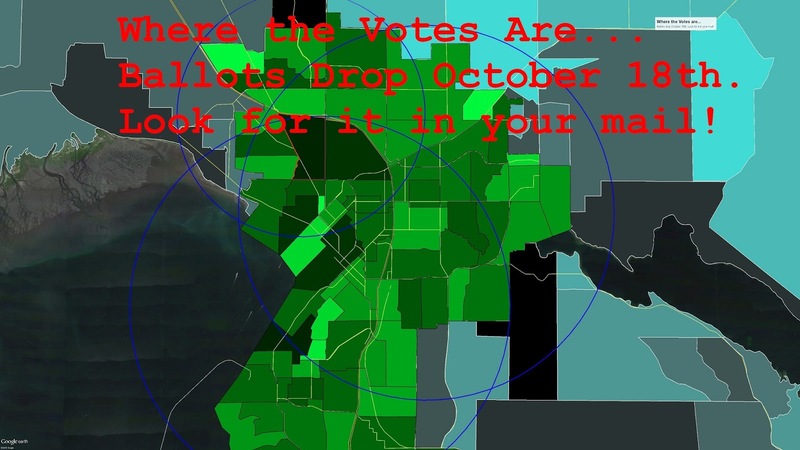 November 1st: 8 days and 60K ballots remaining? 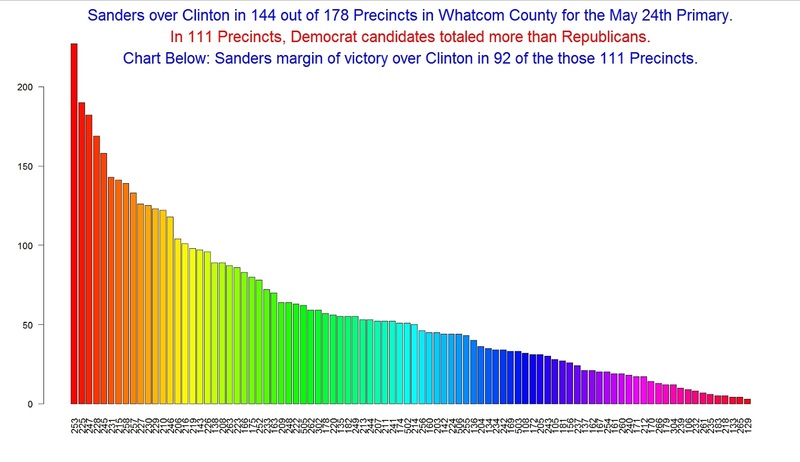 Whatcom County preferred party vote shares from 10.31.2016 'MatchBack' Report by AVReturnedDate. Click to enlarge. Ballot drops tomorrow, October 18th. Look for your ballot in your mail. Picture of the author's grandfather (circa 1972). 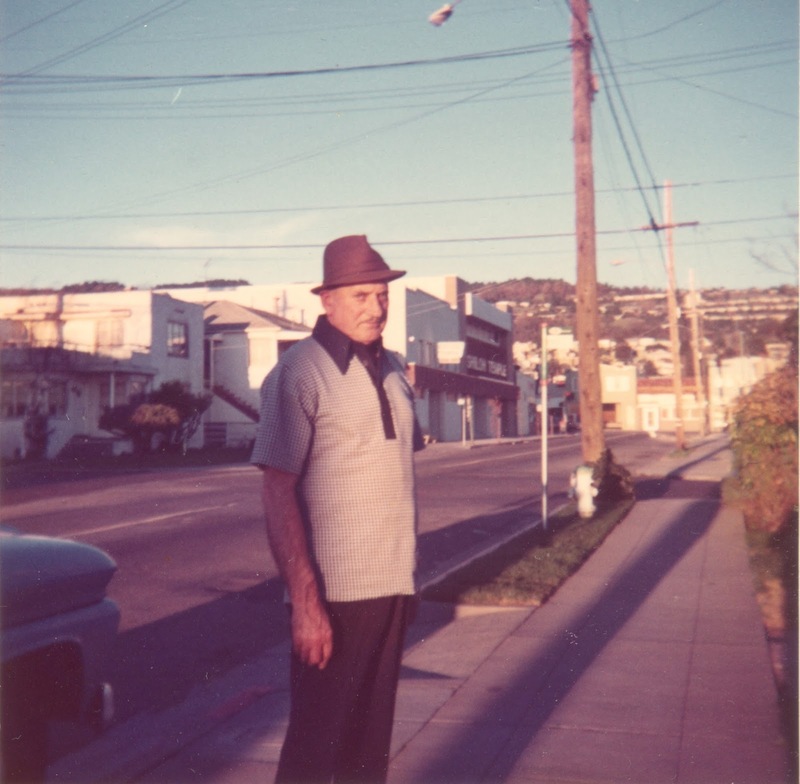 "Bompa" worked on the waterfront most of his life, dropping out of school in sixth grade to support his family. He joined "Harry Bridges and his men" in 1934. During WWII, he and his fellow longshoremen laid on their backs and rolled 55 gallon barrels of oil with their feet into the hull of freighters destined for the war effort. After the mechanization of the waterfront, he became a hod carrier and then a brick mason until his retirement at 65. Why do we vote as Democrats? "We knew people, Ryan. We knew people who were hungry. They were standing in the bread lines and starving to death!" "How and Why Donald Trump and Republicans will win Whatcom County this Fall." 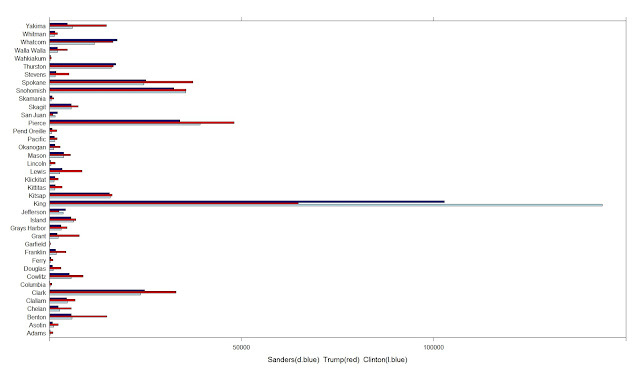 May 24th and August 2nd (2016) Primaries in Whatcom County: Comparing 'AVReturnedDate' by volume. Click to Enlarge. Whether because of summering students or depressed Berners, primary participation in Whatcom County and across WA is unimpressive to date. After a strong weekend showing of 3,990 ballots on Monday, an underwhelming 430 ballots were received today (Tuesday) bringing Whatcom County's turnout to 12,557 (9.49%) with five (5) counting weekdays left. 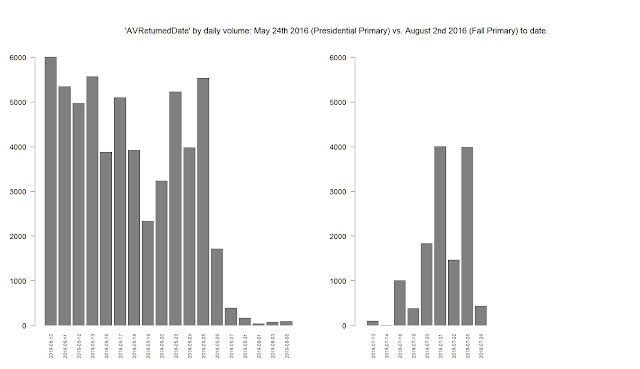 It is an unfair comparison due to student participation in May, but the recent Presidential Primary had 30,869 ballots received in the same number of days ahead of May 24th, 2016. Most of the state is doing no better than us: www.sos.wa.gov/elections/research/Ballot-Return-Statistics.aspx. August 2nd Primary: Are we voting yet? If I were a voter in Whatcom County, my number one question right now is: "Who do I vote for?" Come August 3rd, if you eventually find your precinct turnout is low or that falloff is high, the lists below the break taken from the sample ballot might explain why. PCO elections are not listed here. I am imagining a wave of electoral choices washing over casual or "low information" voters like a rogue wave overwhelming an unaware beach comber. 8/10s of 1% of all ballots have been returned by this morning. The 2015 GE had about 7K more votes than the 54K 2016 Presidential Primary. In the quantile (equal-frequency) class intervals and the spreadsheet below the break, here is what Bellingham and Whatcom County turnout looked like per precinct last week and six months ago. In Whatcom County, Sanders walloped Clinton in Presidential Primary. 53,234 ballots have been counted according to the Auditor . I have 54,074 good ballots with a party selected received from 5/27 matchbacks. Certification is June 7, 2016. This data is current as the evening of 5/24/2016. Data from WA SOS. Click to Enlarge. Tonight's primary portrayed as a three way race. As of Monday the Democrats have a 149 - 74 edge on the Republicans for candidates for PCO. 115 of the Democrat precincts have one or more applicants. Many Democrats are competing against one another for PCO. This isn't necessarily a bad thing, especially if everyone gets together, shares responsibility and helps out! 27 Democrat races tonight have 2 or more PCOs. There is only an election choice if there is more than one candidate. Precincts candidates in 302(5 Candidates) might want to consider a meet. This strong an early return for a primary, even an all county primary, is huge. Keep in mind we barely eclipsed 60K in last November's GE! The registration counts below the break show us why so many are voting. The registration rolls in Whatcom County are now clearly bloated with youth and Berners. If you have ever thought about running for office or PCO, now is the time and this is filing week! Notice in the registration numbers below that those born after 1966 in Whatcom County now eclipse those born before by (66121 - 64694) = 1,427. Notice that those born after 1980 now eclipse those born before 1950 by a stunning (38503 - 27968) = 10,535. Although we are very youth heavy in Whatcom County (thank you WWU, WWC, BTC), these proportions are now not unusual. See similar numbers for all of WA far below. The future is here. Time for the DNC, local Democrats, and the rest of the world to wake up and smell the Millennials and the Berners. Youth and those of us still young enough not to be suffering cognitive degeneration will inherit what remains of the Earth. As my four year old likes to say: "There is no time to lose!" Perhaps I can also quote from the docking scene in "Interstellar": "Cooper, this is no time for caution!" Voters of the 42nd LD Precincts sorted into groups of threes: 3 Votes for last GEs (2013,2014,2015), active but no votes for the last 3 GEs, NA for the last three GEs. 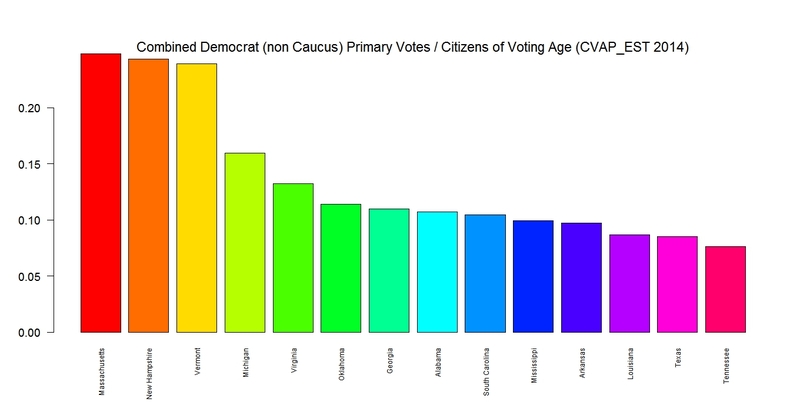 These three groups cover 61% of current active registered voterdb for LD42nd. Based on 4/15/2016 WC voterdb. Click to enlarge. Find R (data.table) code here. Post under construction. The tables below give the change in registered voters in WA over last 18.5 months (11.16.2014 - 05.01.2016). The active voting rolls increased 156,614 during those months with 135K of that increase coming from the top eleven counties. King County alone added 50K. Four counties (AS, CU, GA, LI) lost a total of 765 voters. All Legislative Districts increased their totals. Eight LDs increased registrants by over 4000: 36, 34, 27, 43, 4, 21, 5, and 1. Legislative District 36 has swollen to ~108K registrants, increasing by 5,481 since 11.16.2014. 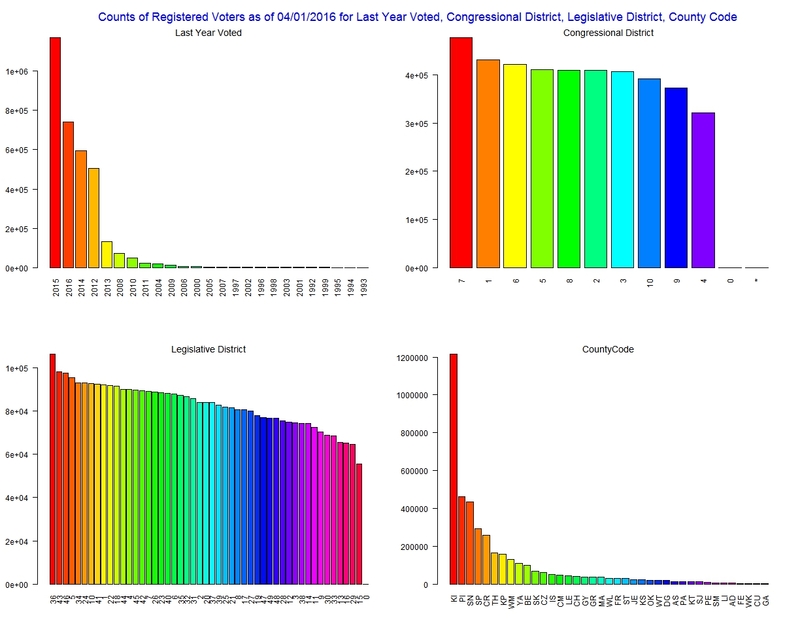 WA Congressional Districts have also seen large increases in registration. CD 7 increased by 20,837 registrants during those same 18.5 months. At the current pace, CD 7 will have 500K total registrants by 11/2017. CD 7 and LD 36 (Seattle) are arguably the most Democratic and most liberal districts in the Pacific Northwest. 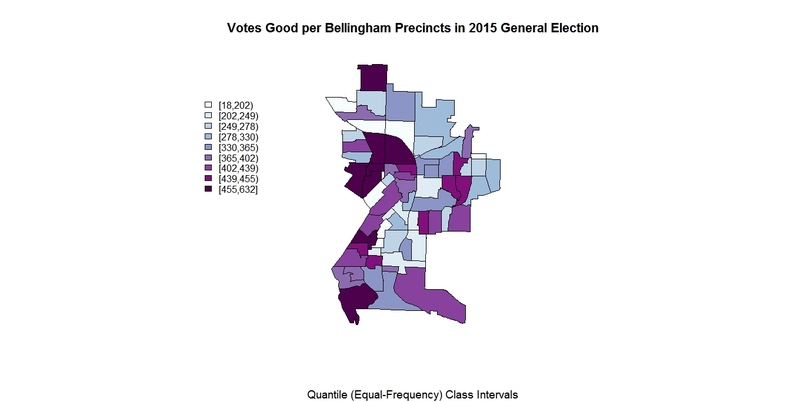 Part III Data on WA Congressional, Legislative, County Districts: How many Berners are out there? The charts and data below the break are dedicated to all you Berners that want to sign up to run for Legislative Districts next week, the third week of May, when Filing Week opens. See PDFs and FAQs here: 1, 2, 3, 4 . You are probably wondering how many Berners are out there, will they vote for you, can you really take back that LD and become a progressive force in the Olympia? I will let you answer all the tough questions while you lie awake at night. Below the break are some data and charts to chew on. The top eleven most registered counties are 84% of the state's registered voters. Active WA voterdb registrants from County (CC), Congressional District (CD), and Legislative Districts(LD) 'partitions' are keyed and sorted by count, registration year, last year voted in the tables below the break. . Additional 'mixed queries' are far below. A 'partition' here I define as the unique number of active registrants that result from the (geographic) intersections of particular CC,CD or LD districts. Currently, there are 141 such unique partitions in WA, however the bottom nine exists simply because county voter rolls have not assigned CD and or LD or both to some small number of voters. "We are not able to elect Bernie because there is so much of this fraud and voter suppression and rigging and caucus cheating going on. So it seems like magical thinking to continue to go forward with this campaign and not address the issue, to not fight the battle that will actually cost the election." New or reactivated registrations are increasingly younger and more urban in Whatcom County. Click to Enlarge. 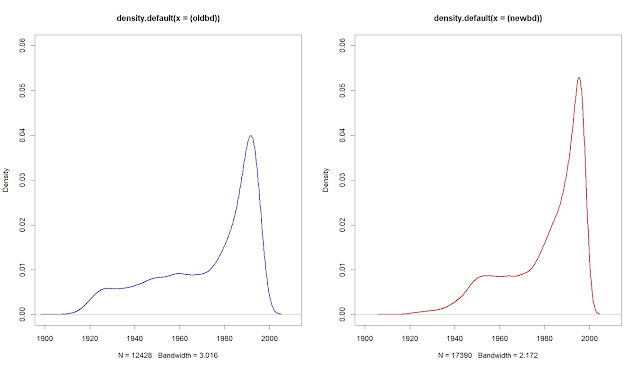 Density Curves. 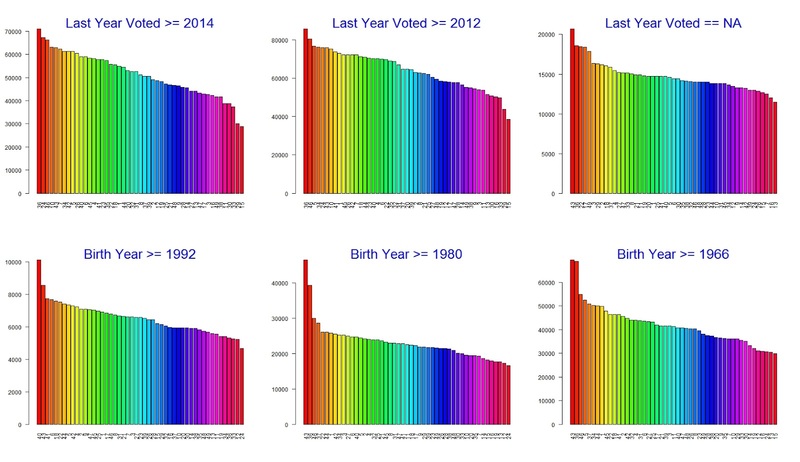 Left: Birth Years of Voters who have left the voter rolls in the last 17 months. 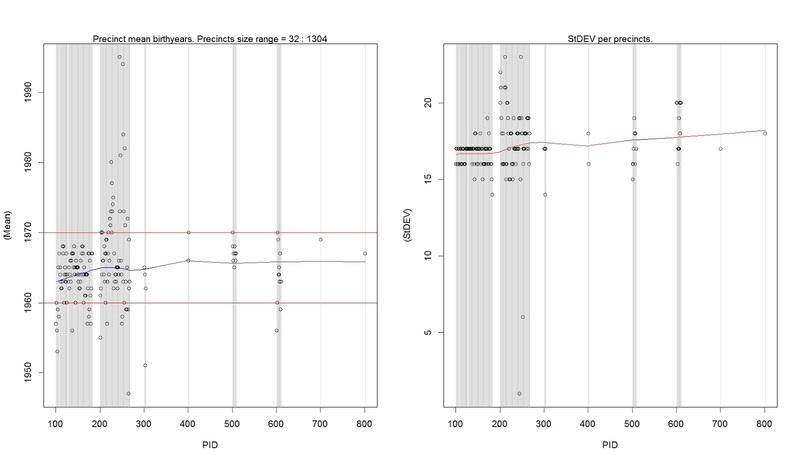 Right: Birth Year of Voters who have joined voter rolls in the last 17 months. Click to Enlarge. 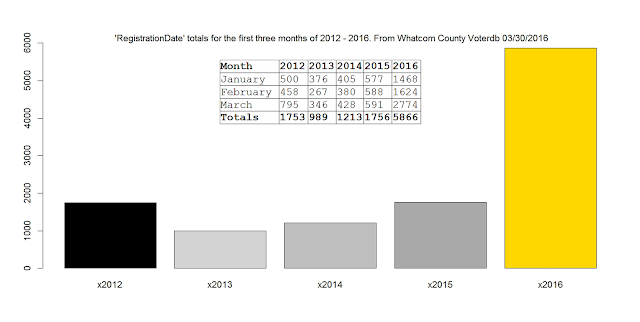 4,962 net voters have been added to the Whatcom County voting rolls in the last 17 months. 12,428 voters have left or been marked inactive. 17,390 have registered themselves as active. (Yes. That is stupendous number for Whatcom County.) We are adding almost 10 registrants per day. These registrants would be a mix of original registrations and re-activations or address changes. The last 17 months have been responsible for 3.9% increase in the voter database since 11/22/2014. Tim Robbins gives 'em hell for Bernie!! "Bernie is not the obligatory progressive that will keep the left in line until the presumptive moderative nominee emerges. Bernie is not the Democrat party insider that will bow down to the elites in the party. We are done with that! We are done with compromising our ideals! We are done with triangulation and fear based politics! ...Change will not happen by choosing a candidate entirely entrenched in the dysfunction of the past." "the most honest candidate there is..."
Rosario Dawson, Spike Lee, and Residente rock the Bernie Bronx Rally. Residente gives an incredible speech: " I support Bernie Sanders because he is the most honest candidate there is." 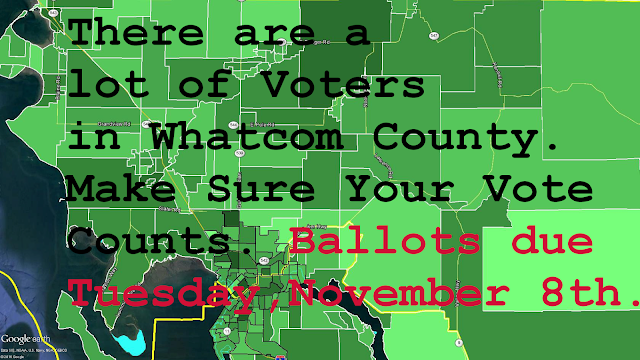 Note: This is for Whatcom County voterdb data only. For WA state data on "The Bernie Effect" please see links here. The Bernie Effect: Change totals for voter registration are up 335% in the first three months of 2016 over the same period in 2015. This may include as many as 4,295 new registrations. Click to enlarge. Most data below the break is for "Registration Date" changes for the period January 1 - March 30, 2016. Bernie Believers line up early Sunday morning. Early Sunday morning my accomplice and I car pooled from Bellingham to Bernie's Seattle rally at the Key Arena . A friend of our family had made it to the head of the line before 6:00 AM and posted as such on Facebook. "I think I can be at your house by eight," my fellow Bernie supporter said. By 9:30 we had made Key Arena and were standing in a line probably about 200 ' x 6 people deep in the light rain. That line would quickly grow much longer. It was 2 1/2 hours before before the noon admission and you might think those hours would be an arduous wait, but then you probably have never stood in a crowd of Bernie Believers before. Democrat Caucus Locations for Saturday, March 26, 2016 9:30 AM Registration! 10:00 AM Start! All this week long the 103 E. Holly Bernie office needs your help canvassing and phone banking. I just talked with the Bernie campaign representatives there and the focus is on making sure they get people going to the caucus and involved in the process. They need precinct captains. If you are willing to volunteer or help, make sure to make it to 103 E. Holly. There are a lot of Bernie groups on Facebook, but the official Bernie office needs your help canvassing the neighborhoods! Bring your smart phone to do this so you can download the MiniVAN app. If you are coming to the office to phone bank, bring your laptop, smart phone, chargers. You can also phone bank for Bernie at home. Be Ready for next Saturday: The March 26th Democrat Caucus!! Age, Gender, City, Zip, LastUpdateDate, Status Reason, Ballot Counted for Last Five Primaries below the break. On March 26th, the Whatcom Democrats will host this year's Democratic Caucus. This is your chance to caucus for your presidential candidate! Yes, you need to be there unless you filled out a surrogate form by March 18th. Otherwise, you need to be there and stay there to cast your votes. Make sure your address and registration is up to date at http://myvote.wa.gov , fill out the Democratic caucus precinct sign-in, find your caucus site and come ready to debate, paricipate and cast votes! Be there early, doors will open after 9:00 AM! Should you want to do more, you can join the party, volunteer for the Democratic Party or you can volunteer for Bernie. You can probably volunteer for Hillary as well, but I will let you find your way to that :-). Team Bernie is hosting two days of action today and tomorrow. Please see more after the break below. Please Caucus!!! For those of you who haven't done phone banking before, you will probably need a laptop or tablet, dedicated phone line or cell phone, cell buds or headset for your analog phone, comfortable chair. It seems daunting when you first start and then the script just falls into place. Sticking to the script and seeming authentic isn't as hard as it seems after your first ten calls. It is good practice talking and working with others. This is something that is critical right now you can do if you have the time. We have to ask ourselves at some point: What are the mechanisms for the suppression of the black vote in the South and how do we define it? Is it any different than in regions outside the South? The Democrats lost 910 legislative seats nationwide between 2009 - 2014. This happened here in WA as well. But it *really* happened in the South where literally dozens of legislative seats flipped from Democrat to Republican. 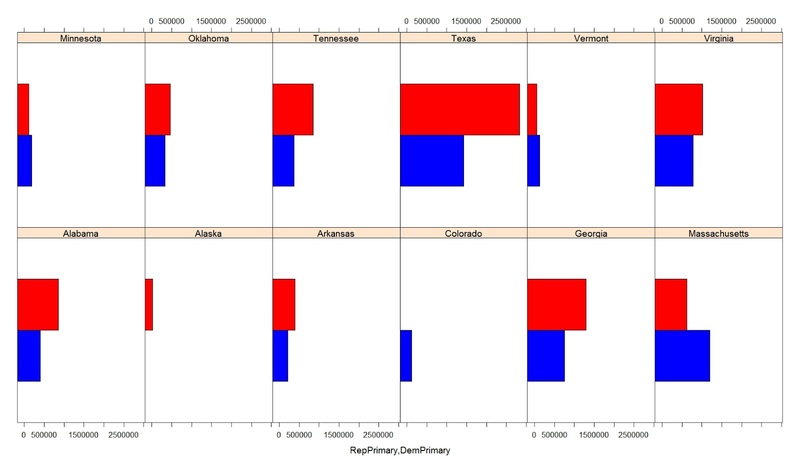 These 12 primaries/caucuses generated (5.9M(D) + 8.5M(R)) = 14.5M votes. In the 2012GE these same states generated 32M votes, 14.7M for Obama alone. The states here showing some "swing" potential are Virginia,Oklahoma,Colorado. Fundamentally a (complicated) southern state, Virginia actually went to Obama in 2012 as did Florida.Oklahoma went Republican in 2012, Colorado went Democrat. Both came out for Bernie Saunders in this primary. Register to VOTE! !...then...Sign In to your Democratic Precinct Caucus! After you have made sure you are a registered voter at myvote.wa.gov, you can fill out, print and sign your *DEMOCRATIC PRECINCT CAUCUS SIGN IN* : https://www.demcaucus.com/register. I found on Win7/Chromium that I could save to it to PDF if I couldn't print it immediately. That put me in the system, gave me my primary location, my precinct ID, my VAN ID and let the Democrats know I was coming! You eventually need to print it out and sign it and bring it with you to your caucus location! 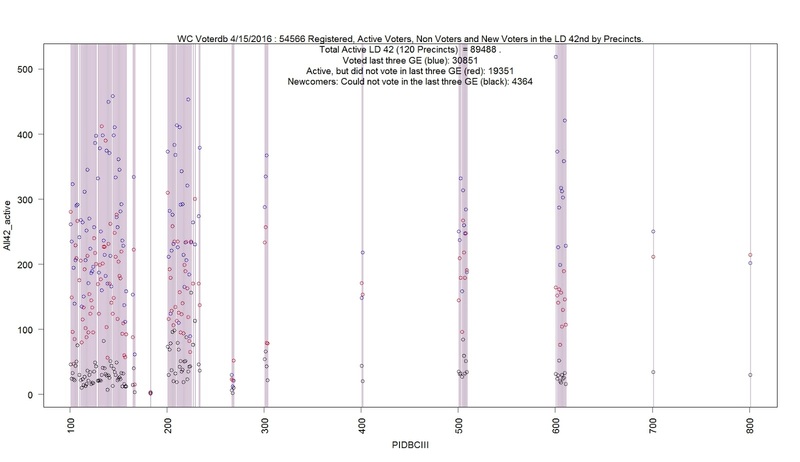 The data above is from a 1/27/2016 voterdb history. On the left, the rainbow background and the fading shadows in front of it show the per precinct difference between registered voters and participation in the GE 2014 and GE 2015 balloting. (The most recent voter birth years are not included.) Curiously, despite heavy registration of those under 65, voter turnout has collapsed as it heads toward the youngest birth years in Whatcom County. Click on the graphs to enlarge. 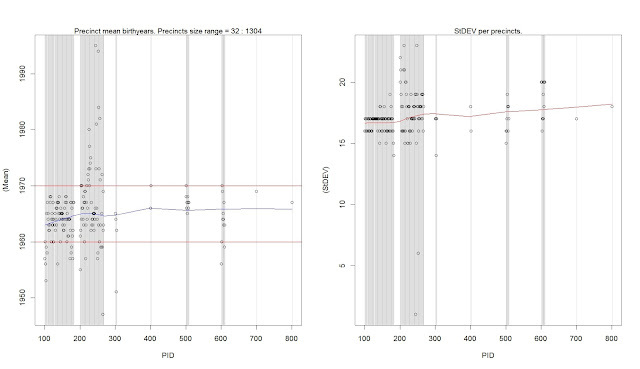 The dense band of mean birth years of registered voters between years 1960 and 1970 is a statistical mirage brought about by heavy registration of both boomers and millenials on either side. GenXrs are the bluish trough (far top left chart) between prewars + boomers and millenials, + perhaps Gen "Z". 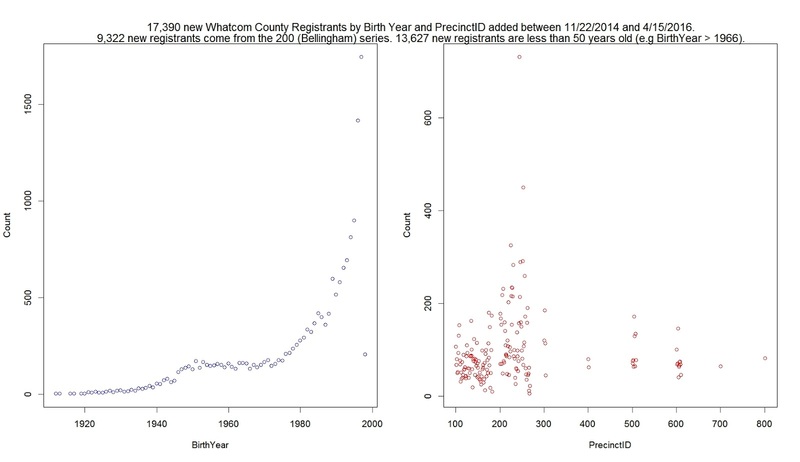 At right, a relatively high SD per precinct helps hide an accurate assessment of voter age in Whatcom County. More age statistics are below. Click on the graphs to enlarge. Updated 2/10/2016: All School and Fire levies pass. 32% turnout with 40K voting. Today (February 9th) there is a special election for school and fire district financing throughout the county ... Remember to Vote. Drop Boxes are placed throughout the county. If you mail your ballot, it must be postmarked (with stamp) by February 9th. If you are around downtown Bellingham, there will be a drive through drop box near the court house open until 8 p.m. You can check your voter status, update your address, or register to vote online in WA at MyVote.wa.gov . Some Charts from the 2015 Election are below the break.